Cumberland City Hall is located at 57 North Liberty Street, Cumberland MD 21502; phone: 301-759-6434. Photo: Francis Haley House, ca. 1870, 634 Maryland Avenue, Cumberland, MD. Listed on the National Register of Historic Places in 1982. Photographed by User:	Pubdog (own work), 2011, [cc-by-1.0 (creativecommons.org/publicdomain/zero/1.0/deed.en)], via Wikimedia Commons, accessed May, 2014. Through much of its history, Cumberland's economic prosperity derived from its position as an early transportation hub linking the East Coast with the Midwest. Because of its strategic location at a gap in the mountains, Cumberland was in 1806 the starting point for the nation's first highway (the National Road, later known as U.S. Route 40), which reached Wheeling (then part of Virginia) on the Ohio border in 1818. Of even greater significance to Cumberland's economic development in the nineteenth century were the Baltimore and Ohio Railroad, which reached Cumberland from Baltimore in 1842, and the Chesapeake and Ohio Canal from Georgetown to Cumberland, which opened in 1850. By the 1890's, five railroads served Cumberland and employed over 2,000 local people. The C&O Canal was also an important commercial link between East and West, providing bulk transport of items such as coal, flour, iron, and limestone products. Facilitated by Cumberland's importance as a transportation hub, manufacturing emerged as a major force in the local economy in the nineteenth century. 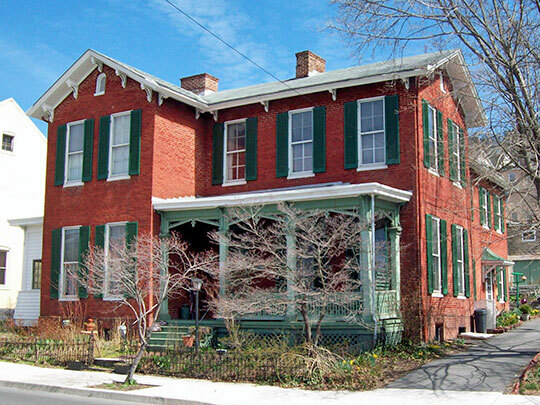 By the mid-nineteenth century Cumberland was the second largest manufacturing center in the State of Maryland, a ranking not surpassed until approximately 1915 by Hagerstown. Important industries included glass manufacturing, brewing, textiles, and iron and steel works. The B&O Railroad's rolling mill, located off Williams Street and Maryland Avenue, was a major employer in Cumberland from 1870 into the twentieth century. The twentieth century witnessed major changes in Cumberland's economy. Losing out to competition from the faster-moving railroad, the C&O Canal declined in importance until it closed in 1924. The railroad industry also suffered from competition from other modes of transportation in the twentieth century. Traditional industries such as glass making, textiles, and breweries lost ground or disappeared. Nevertheless, manufacturing remained the major source of employment in the City and Allegany County as a whole until relatively recently. Both Kelly Springfield (which manufactured tires at its facility in southwest Cumberland) and Celanese (which established the Amcelle Plant for the production of cellulose acetate about five miles south of the City) located in the area in the 1920's. These companies along with PPG Industries and Westvaco were major employers through much of the twentieth century. City of Cumberland, Maryland, 2004 Comprehensive Plan, www.ci.cumberland.md.us, accessed June, 2012.